Next Tuesday, September 4th, at 6:30pm, join in the fun at Davis Master Chorale’s annual potluck dinner. It will be held at the Bowery behind the LDS church building at 2435 E Canyon Rim Rd, Layton, UT 84040 [MAP]. This will be a TRUE potluck, so bring your favorite dish and a hearty appetite! Announcing the FREE 2018 Summer Concert! 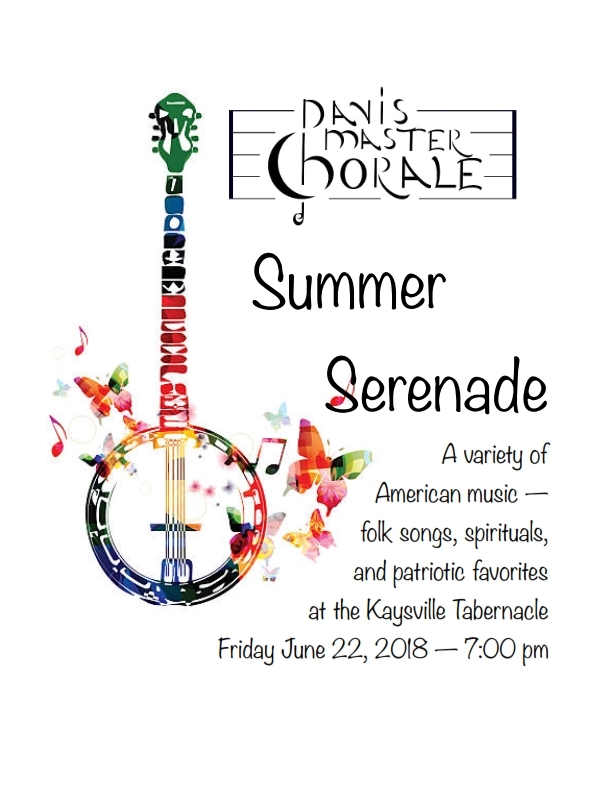 The FREE 2018 Summer Concert will be help on Friday, June 22, at 7 pm, in the Kaysville Tabernacle. It features an hour of folk music, Americana, spirituals, and a few patriotic favorites. Bring the family! <– Click on the picture for a full page PDF flyer. Davis Master Chorale © 2019.